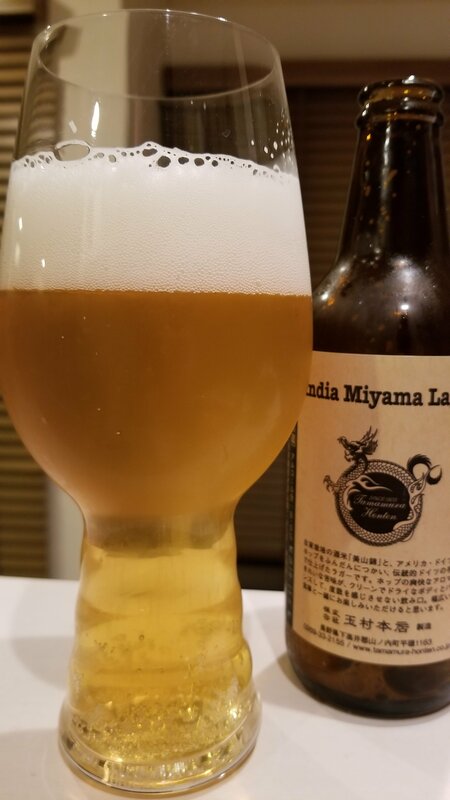 Shiga Kogen India Miyama Lager is a 6% India Pale Lager from Tamamura Honten, based in Nagano, Japan. It’s part of their limited edition lineup with it being first released in October 2014 and is also a collaborative effort with North Island Beer. This year’s effort is a collaborative effort with Hop Kotan Brewery, also based in Hokkaido. It is also brewed using locally grown rice, the same strain that is used in the sake from Tamamura Honten. .
Shiga Kogen India Miyama Lager poured out a golden yellow colour with a plump white head on top. What haze there was was due to the condensation on the side of the glass – it is a lager, so should be served cold. The aroma coming off was a citrus lemon bouquet with some hints of sweet biscuit malt, but it was more hoppier than your usual lager for sure. There were some hints of pine too once it had warmed up but nothing as potent as the citrus kick. Shiga Kogen India Miyama Lager is marketed as being “Super Nigai” or super bitter. And for a lager, I guess it was. But for those coming off of an IPA, then Shiga Kogen India Miyama Lager is probably not as bitter as you’d think. It had the citrus lemon flourish from the nose but besides that, it had, surprisingly, a standard lager-like body. A light bit sweet with a slight hint of toasted biscuit coming through once it had warmed up. It finished off with a lingering lemon bitterness but besides that, it did not stand out. If you like your lagers with a bit more hoppiness to it, then Shiga Kogen India Miyama Lager is worth a try. But personally, stick to an extra pale ale or IPA if you’re going for hops. Hm, wasn’t aware it was collab with Hop Kotan this year. I’ve liked previous versions fairly well. Curious if you’ve tried other versions how it compares. Not a fan of Hop Kotan so far, but generally, no matter who Shiga Kogen colabs with, it tastes like a Shiga Kogen, so I imagine it’ll be about the same.